We are Terho and Maria Kane rvikkoaho, both from the same small town inWestern Finland. We have three sons, aged 9, 11 and 13, two cats, a dog, and way too many Legos on the floor. We have been living in Israel for almost six years now, altogether. This means that the youngest of our sons has lived in Israel for almost two thirds of his life! We both studied at the University of Eastern Finland, with Terho majoring in Theology and Maria in History. 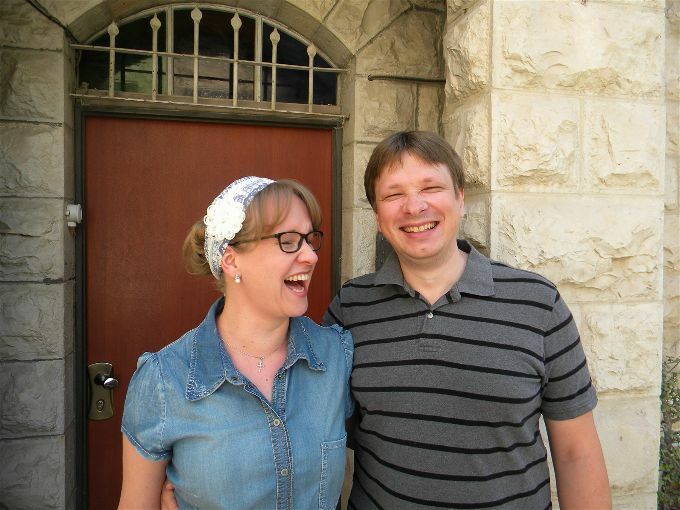 Terho is an ordained minister in the Finnish Lutheran Church, where he served as a pastor prior to our move to Israel. Maria was primarily a stay-at-home-mom before coming to Israel. Our family first came to Israel in 2012. We spent the first year here studying Hebrew (while our boys were learning English in school), and learning to survive and enjoy life in a country so different from our native Finland. For both of us, serving the body of Christ abroad has always been a clear calling. Though we never felt a specific call to come to Israel, this is where God led us. And it was at the Caspari Center that we found our own place and calling. Maria has been serving as the Caspari Center librarian since August 2013. Terho joined the Caspari Center team in 2016 and was given the mysterious job title of “Project Coordinator”. In practice, he is editor-in-chief of Caspari’s Mishkan journal, he organizes the Open Lectures, and also helps plan and organize various international courses in conjunction with the other staff members. In addition to his work at the Caspari Center, Terho is also involved with the Fellowship of Christian Students in Israel (FCSI) and King’s Kids. For both of us, working at the Caspari Center has been a dream come true. We are both gifted with the opportunity to serve here with our respective skills and education in the best possible way. Education is extremely important for us, and being a part of a ministry that is focused on equipping the body of believers through education is more than we could have hoped for. Sharing the information and helping those who want to learn more has always been close to our hearts. And as we share that information, we ourselves also learn so much. The best part of the work at the Caspari is that we are not only giving, but also receiving, constantly. During these years in Israel and at the Caspari Center, we have learned so much about the Messianic movement, about the Jewish roots of Christianity, the Bible, Judaism, and many other things as well. Also, working in a multicultural environment where people come from very different backgrounds also teaches you a lot about yourself and your own culture. When we’re not working, we both enjoy the peace and quiet of home – or at least, as much peace and quiet as is attainable in a house full of boys. Regular family life is more or less similar, regardless of the country in which you live, and our chores take all the time we have left after work. But whenever we do manage to find some extra time, Terho likes to read and play computer games, and Maria enjoys reading and playing piano. ← Welcome to the Caspari Center Library!